5 Tips When Booking a Party Bus. Do you have a special occasion coming up and you’re looking to spice things up a bit with a party like you’ve never had before? Well, the best way to get the most out of your event, party, or just night out is to book a party bus! Here at Naperville Limousine, we have been renting out party buses and pumping up our clients’ parties for over 20 years. By booking a party bus with us, you will receive the highest quality service and an unforgettable party! If you don’t want to take our word for it, just check out our 700+ reviews. In Chicago, we are one of the highest-rated party bus service providers. Sure, booking a taxi may be a more modest way to go, but is modest really the direction you want to go in? In a taxi, you’ll feel like you’re all squeezed in a small space waiting for the trip to finally end. 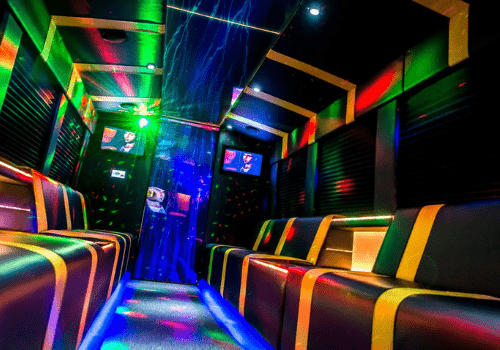 In a party bus, on the other hand, you’ll have plenty of space to chat, laugh, and even dance! You’ll get the party started before you even arrive at your destination, making your night unspeakably better and much more fun! Inside, you’ll find a dance floor, bar, club lighting and, of course, a high-end sound system! What could be better than a party on wheels taking you to your destination? You’ll have the party started long before you arrive! So, whether you’re still thinking about booking a party bus or have already decided, we’ve put together a list of 5 tips when booking a party bus which will hopefully clear up any uncertainty you may still have and make the process of booking a party bus as simple as possible! This is one of the favorites – party bus for up to 22 people! At Naperville Limousine, we have 3 different party buses: 1 small one fitting 12 people and two larger buses fitting 22-30 people. Our smaller bus features a flat screen with a sound system, a bar, a private glass with blinds, and moody lights. Our larger buses are even more luxurious! You’ll find a high-end sound system, a bar, club lighting, and a full dance floor. One of our buses even features a dancing pole! Booking a party bus is actually very simple. Just choose which party bus you’d like, make a reservation and wait for your party to arrive on a special day! Also, feel free to choose any route and destination and our drivers will take you there in style! You can book your party bus online or by calling us at 630-778-5959. You might be thinking… but what about the booze?? Well, if you’re booking your trip outside of the city of Chicago, then we’ll include the alcohol in your bus. You’ll have beer, water and soft drinks. Also, feel free to bring your own drinks as long as you’re above the legal drinking age! BUT, if your trip will be within the city limits of Chicago, then alcohol is not allowed or included. The reason for this is that there was recently a law passed regarding alcohol in party buses within the city of Chicago. But hey, the most important part isn’t the alcohol but the music, right? Absolutely no restrictions here! Feel free to make your own playlist with your favorite songs and jam to them throughout your trip with our high-end sound systems! Party buses will make you feel as if you are in a club! Carefully count and plan ahead how many people will be at the party as our buses have strict limits for the number of passengers! We have two different sizes of party buses. The smaller bus fits up to 12 people and the larger one fits up to 30. 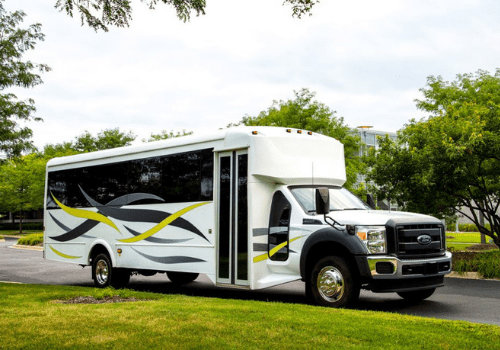 One of the best benefits of booking a party bus is that you can get a lot of people to your destination in just one vehicle rather than renting numerous taxis or smaller limousines. And of course, the best part is that instead of just sitting around, you’ll be partying the whole way there! Another important factor to consider when booking a party bus is the duration of your party, of course! Most of our customers rent our buses for about 6 hours but we have a minimum of just 3 hours for the 12-passenger party bus and a minimum of 4 hours for the 22-passenger or 30-passenger party bus. Feel free to choose any duration above the minimum but keep in mind that time will surely fly in our party buses! We understand that the price to pay is a crucial factor in making your decision to rent a party bus, so read on for the prices of our usual 6-hour rentals. As we have differently-sized buses, the prices are also different. Our smaller bus that fits up to 12 people has an hourly rental of $120 (including tips and taxes), so a 6-hour rental would cost you $720 in total. Our larger party buses that fit 22-30 passengers have an hourly rental of $210, making your 6-hour rental $1260. If you’re still not sure about which bus to choose, don’t hesitate to call us at 630-778-5959 and make an appointment to check out our buses in advance before making any decisions! Now that you know all the important tips and steps to take before booking your party bus, there’s no need to wait anymore! Book your party on wheels for a night you and your friends will never forget. To book your party bus at Naperville Limousine, call us at 630-778-5959 or get a quote.